To anyone with a love of motorsport at the time we have come to think of as the sport’s golden age, names of photographers like Alexander, Cahier, Klemantaski, Goddard, and Rowe are household names. That they should have had such impact is partly because they simply bothered to show up. Not many did, in those days. 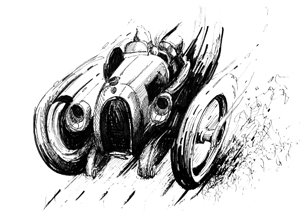 In a world that still bore the scars of World War Two, newspapers and magazines were only just beginning again to build up a readership for motor racing and to dispatch correspondents. 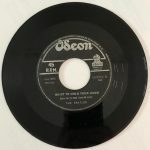 To Americans especially it was the images their countryman Jesse Alexander sent home that connected them to European racing. Attracted to the budding sports car movement in the US he cut his teeth photographing the Pebble Beach, Golden Gate Park, and Palm Springs races. Thanks to an inheritance from his mother he was able to pay his own way to cover the 1953 La Carrera Panamericana and the next year install himself in Europe, where the big-time racing in those days took place, for a decade. Precisely because so few Americans covered racing professionally, Alexander became a veritable fixture at races. Driving his own Porsche to the same circuits as the teams he basically lived the same nomadic life. The utter lack of safety-mandated restrictions to access allowed him—and anyone—to move about freely and get close to his subjects. He made it a point to know everyone’s name, not just the drivers. The people in front of the camera came to know—and more often than not like—the man behind the camera. Celebrating and commiserating with them fostered an unguarded candor that is a key factor in the types of images Alexander was able to capture and that early on distinguished his work, especially the portraiture. For Homo sapiens a crucial tool for interspecies rapport is the ability to see and “read” another’s face. The open-faced helmets in use in that era allowed Alexander to capture emotions that in turn engage the viewer—unlike the modern-day full-face helmets that, in the absence of other telltale body language, make anyone look as unapproachable as Darth Vader. As the title indicates, the focus is on Porsche which was making a big splash on the racing scene in those years with different models in various series. 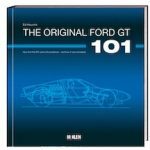 The content of the book is divided by event (La Carrera Panamericana, Le Mans, Mille Miglia, Monte Carlo, Nürburgring, Reims, Rouen, Targa Florio, Zandvoort). There is no narrative other than the detailed photo captions. 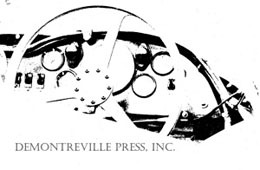 Little to no information is given about the events proper and the reader who might want to see, say, a circuit’s layout or read about its history will want to have a copy of Grand Prix Battlegrounds by Christopher Hilton (Haynes, 2010) to hand. In addition to the racing images there is an assortment of snapshots of Alexander’s travels along with anecdotes and reminiscences. One of this book’s important assets is its size and landscape format. Even at the generous width of 13 inches several photos cross over the gutter but in only a few cases does this cause loss of important/interesting image area. Quite a few images have a black satin surround but it is surprisingly fingerprint-resistant. The book format, incidentally, corresponds quite closely to the smallest of the three sizes at which Alexander offers his original gelatin silver prints on Bergger multigrade fiber glossy paper, each individually processed by hand and signed. Some of the photos here have appeared already in Alexander’s other books but not at this size. Readers with a deeper interest in photography will want to pick out (by racing number) those cars that are shown in both color and b/w and ponder the esthetics. For the sake of the aspiring photographer who looks at this book so as to learn it would not be unfounded to remark that from a strictly technical and compositional perspective not all of the photos in this collection are fully realized. This does not diminish their allure, which lies mainly in the fact that they exist at all, their documentary nature, and their off-the-cuff immediacy. Make a habit of looking under the book jackets—you may want to leave this one off! Readers who like signed books can get one directly from Alexander at the regular retail price, or a Publisher’s Edition of 300 individually numbered copies signed by both Alexander and Dan Gurney at $135 (the first 50 of which in garment-quality leather at $249) from the publisher. Won Ippy Silver Medal 2006. 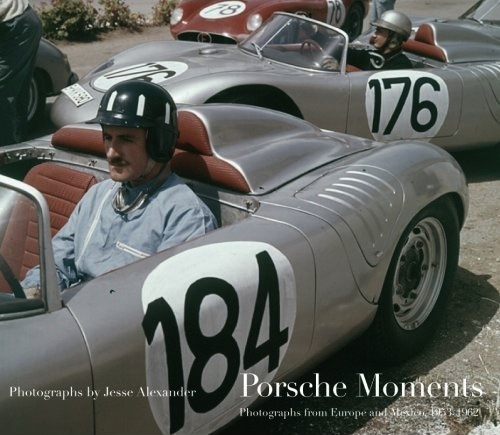 This is a high-quality coffee table book meant for any Porsche lover who relishes the photographic history of this great car company. Alexander is arguably one of 2, or 3, great old-time photographers. The other two, from my viewpoint, are Cahier and Klemantaski. 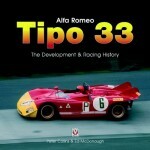 All three were there at the resurgence of interest in car racing after WW 2. By then, camera equipment had greatly improved and high quality images became possible from very portable cameras. From my readings, it would appear that he was a Germanophile and probably would have used a square format 6cmX6cm Rolleiflex for the more posed and higher quality shots. The action and off-the-cuff shots were probably shot with a rangefinder Leica 111g or M3. Because Jesse managed to get close to the Porsche management people, his access was unlimited, and it shows. He manages to give us a feeling of really being there, up close and personal. Overall, this is first rate photography. The advent of autofocus and multiple lens choices allows today’s photographers an effortless creativity which was not possible when these pictures were taken, but these are exciting nonetheless. The only thing that surprises me is that he rarely uses the technique of following the car with a slow shutter speed to give a sense of speed. He probably has an explanation to which I am not privy, but isn’t that what car racing is about? He includes a few color photographs but I feel his real forte was B/W. Finally, I must say that, to historians and nostalgia buffs, his recording snapshots of those simpler times is of immense value. Count me in the group that cares! All the photographs in this book are extremely well printed, both as photographs and in book reproduction. Knowing a little bit about printing, I would guess all the photographs were printed as color photographs (in RGB for those of you who might care) even though most are in B/W. This gives a certain richness that is hard to get in pure B/W book printing. The printing is so good that various photographs could be torn out and mounted as exhibition prints! 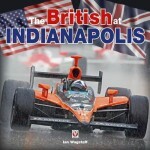 The publisher, David BullPublishing, seems to be a stickler for quality and it really shows here. The overall quality shows in the price and size of the book, but if you’re a Porschephile (did I just make that word up?) you’ll treasure this book forever.